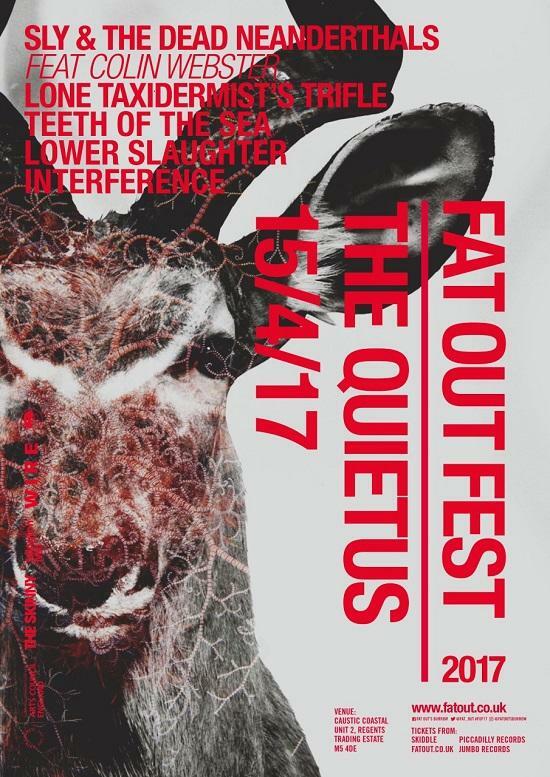 Details of The Quietus' stage at Salford's Fat Out Fest have been revealed, with the ferocious collaborative force of Sly & The Dead Neanderthals, featuring Colin Webster heading up the curation, with Lone Taxidermist, Teeth Of The Sea and Lower Slaughter completing the bill this April. The headliners take the shape of a brutal double-pronged effort by noise titans Sly & The Family Drone and free jazz outfit Dead Neanderthals, along with Colin Webster, who are gearing up to combine forces on record with forthcoming collaborative album Molar Wrench, having appeared together on God Unknown Records' split 7" last year. A truly petrifying pair-up, in collaboration the two promise nothing but the most uncompromising sonic hyper-violence when they take to the stage together in April. Lone Taxidermist, the chaotic project of cosmic Cumbrian synth artist Natalie Sharp should be a similarly stupefying live experience. On her new project Trifle she's joined by Philip Winter and Will Kwerk for a journey into the murky, intertwined depths of sexual fetishes and food. The live show features music from the group's forthcoming debut album of the same name, and explores the shadowy worlds of sploshing, cake sitting and crush fetish. It features a visual backdrop from a series of YouTube cake fetishists, and AV artist Ross Blake's specially commissioned projections, while the stage is set to be transformed into a PVC plastic container inhabited by a gang of 'Arse-onist' women performing dance rituals based around cake-sitting, armed with cream, custard and jelly with which to 'violate' the audience. Also on the bill, tQ favourites Teeth Of The Sea need little introduction. Since 2006 the group have set themselves apart with an incendiary brand of immense, genre-pushing psychedelic rock. Their last record, Highly Deadly Black Tarantula was named at number 17 in our favourite albums of 2015. Completing The Quietus stage are acclaimed noise rock quartet Lower Slaughter. With Sinead Young, formerly of Divorce, joining the band on vocals in 2015, they've performed regularly alongside the likes of Gnod, JK Flesh and more, with their debut album What Big Eyes drops later this year. Elsewhere at the fourth edition of Fat Out Fest, tQ's John Doran is set to DJ a selection of Middle Eastern bangers alongside Lone Taxidermist's Natalie Sharp, who provides improvised 'interference' via splices, loops and effects applied to voice and analogue synths. Also on the Fat Out Lineup at large are the likes of The Bug vs Dylan Carlson of Earth, Pigs Pigs Pigs Pigs Pigs Pigs Pigs, Blood Sport, Part Chimp and more. The lineup is curated by six specially chosen collaborators, who this year include The Quietus, Baba Yaga's Hut and The Wire. Fat Out Fest takes place from April 14-16 at Islington Mill in Salford. Weekend tickets are on sale now for £65, while day tickets are £25. You can buy them and real full line-up information here.